Being spoiled this summer with such sunny and hot weather here in Montreal, I've been making the best of it and have been spending a lot of time outdoors! Not having A/C also means I have been spending a lot of time cooling off in the pool. Since I have been soaking up the sun and taking dips so much, I've been reaching for more body care products to repair and moisturize my skin after sun and chlorine exposure. Call me obsessed, but whenever I see that a product contains coconut oil or has a coconut scent, I am immediately drawn to it. So when I heard about the new Palmer's Coconut Oil Formula line*, I knew I wanted to see just how good these actually are. 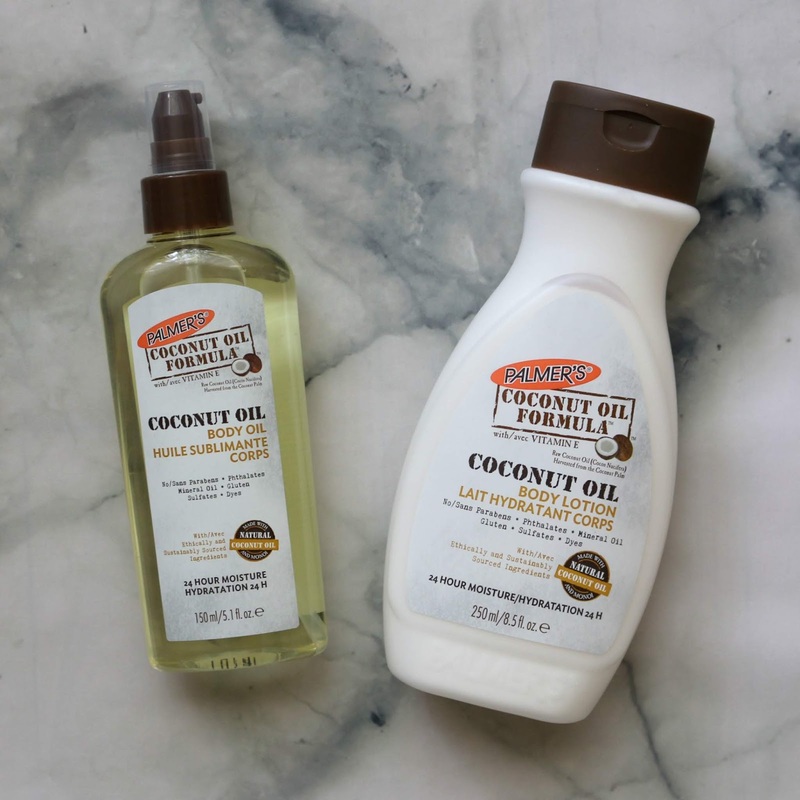 I've been a fan of Palmer's for many years (their Cocoa Butter Formula body products and face oil are ones I highly recommend! ), so I'm excited to be sharing these new additions with you. What I appreciate so much about the Palmer's Coconut Oil Formula skincare range is that it contains a bunch of natural ingredients that have been ethically and sustainably sourced from around the world. The raw coconut oil comes from South East Asia, monoï oil from Tahiti, sweet almond oil from Spain, and added vitamin E work together to envelop the skin in a fresh and sweet scent, with the antioxidant-rich formula also being infused with Tiaré flower petals. All products are free of parabens, phtalates, mineral oil, gluten, sulfates and dyes. The Palmer's Coconut Oil Body Oil (C$5.99, 150 mL), while sounding quite heavy, is actually very light and quick-absorbing once applied. It comes with a pump dispenser, making application a breeze. 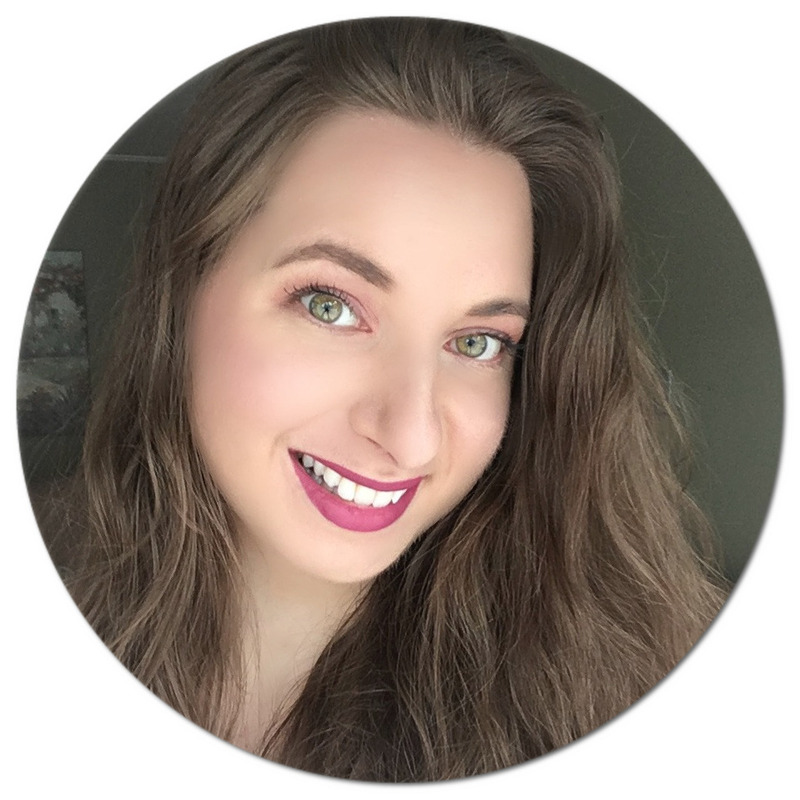 Within a couple of minutes, the oil is dry to the touch and leaves my skin looking extra glowy and smooth and I don't have to worry about a greasy residue that will transfer onto my clothes. The base is made out of soybean oil and contains added canola oil, safflower oil, grapeseed oil, macadamia seed oil, sunflower oil, argan oil and even cocoa butter. You can just imagine what a delight it is to slather my skin in the stuff! It also provides 24-hour moisture and the rich tropical scent lingers for a couple of hours. 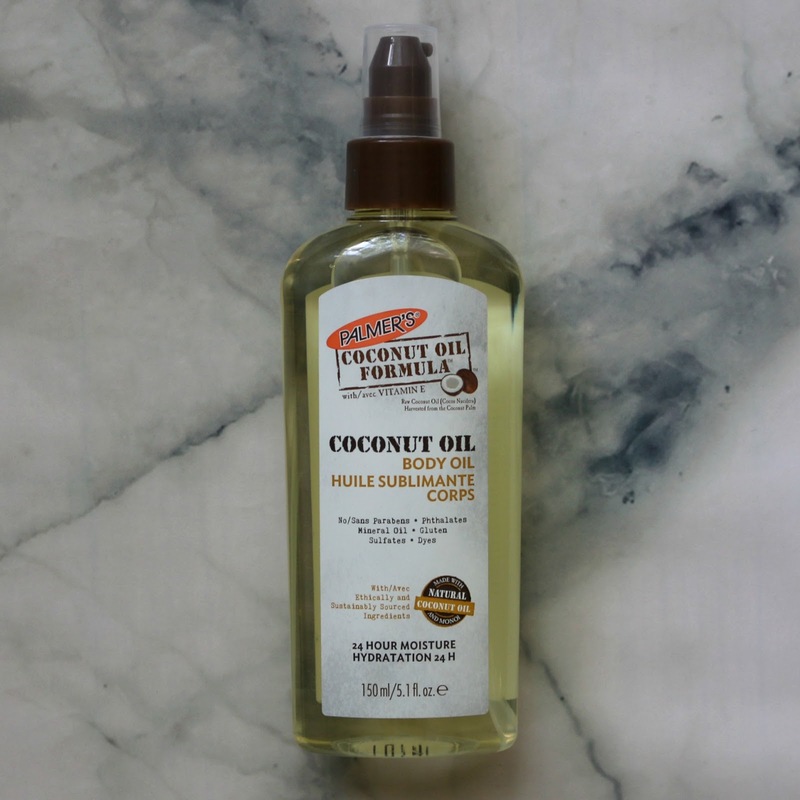 I like applying this body oil as soon as I step out of the shower to lock in that moisture! The Palmer's Coconut Oil Body Lotion (C$5.99, 250 mL) not only contains coconut oil, but it also includes coconut milk to give it a creamy texture. Just like the Body Oil, it sinks into the skin very quickly without leaving a white layer behind. You also don't have to worry about feeling sticky or greasy following application. The scent is again very uplifting and sweet (I would say it is more pronounced compared to the Body Oil) and it also lingers, and my skin stays moisturizing all day long! I have especially been loving using this lotion on my feet and elbows at bedtime since they can always use some extra care. Best part? Every time I slather my skin in this stuff, I start daydreaming about being on holiday somewhere tropical! Once again, I am no less than impressed by these Palmer's products! You can find them at Walmart in Canada. Have you tried anything from Palmer's? *Disclaimer: This post was sponsored by Palmer's. All thoughts and opinions are my own. Some affiliate links provided. A few days ago I asked my daughter what she was loving this summer and she said good ole Palmers Coconut Oil. I need to grab some lotion the next time I'm shopping. My daughter raves about this stuff! I have heard of Palmer's although I haven't used it so I will be checking into it soon. I have never tried the Palmers line. I will definitely have to pick some up and try it out! Have to admit I haven't heard of this Palmer's oil before. Now I need to get to the store and check it out. I like using coconut oil. I love that you can find these quality products at Walmart. I hate to make extra trips all around the city. This is an awesome opportunity! I have used MANY Palmers products over the years and I have always been really happy with them. I am going to have to try this. I love anything and everything that has to do with coconut oil. They do such a good job for both inside and outside of the body. I used to use these formulas when I was pregnant and it definitely helped with some of the scars I got. I have never used coconut oil but if it is good to moisturize after the sun I will use it. I generally have used other moisturizers with not so great success in the past. I know I'll love these! I've used Palmers for years with great success. I'll have to try their coconut oil line! I have tried Palmers in the past and liked it. This new one sounds like something that I need to try. I love the way coconut oil moisturizes. I can't wait to give the Palmers products a try. I'll be looking for them at the store. I'm not familiar with Palmer's. I love the smell of coconut, it reminds me of the beach, I bet these smell great. I remember using Palmers when I was pregnant with both of my girls. I really should grab one of these and give them a try! I should have use this the whole time in my second pregnancy to keep stretch marks away, but I got a bit cocky because I didn't get stretch marks with my first baby but I did with my second. I was so dumb! Coconut oil does really well with my skin. I will have to try out Palmer's sometime. Yes, I really love this brand. I used to use their cocoa butter formula every day when I was pregnant!! I love Palmer's skin products. I used their lotion when I was pregnant to avoid stretch marks and it worked effectively. I haven't heard of this brand, I'm in need of a new moisturizer. The one I'm using just can't keep up with being outdoors and in the pool. Palmers is a family favourite and this would be a great addition. I love coconut oil. it has so many uses. I use coconut oil for just about everything but this one sounds particularly interesting. Ill have to go try it out. Thanks for sharing! I love Palmer's, but I haven't tried their coconut oil. We always used their cocoa butter products. They really are the best! That lotion is the best lotion and it's affordable too. My grand daughter just put some in my shopping cart this week for herself so she's learning from me, lol. I've not tried the body oil before. I haven't tried any products by Palmer's. What I do know, is that Coconut oil, really, has a lot of good effects. I will check Palmer's the next time I go shopping. I want to try this so badly!! We love coconut oil and this brand...I used it growing up!! Coconut oils, and everything coconut is apparently really good for our skin/body/health and for whatever reason I can't stand to be able to handle the smell, although I really need to use it! 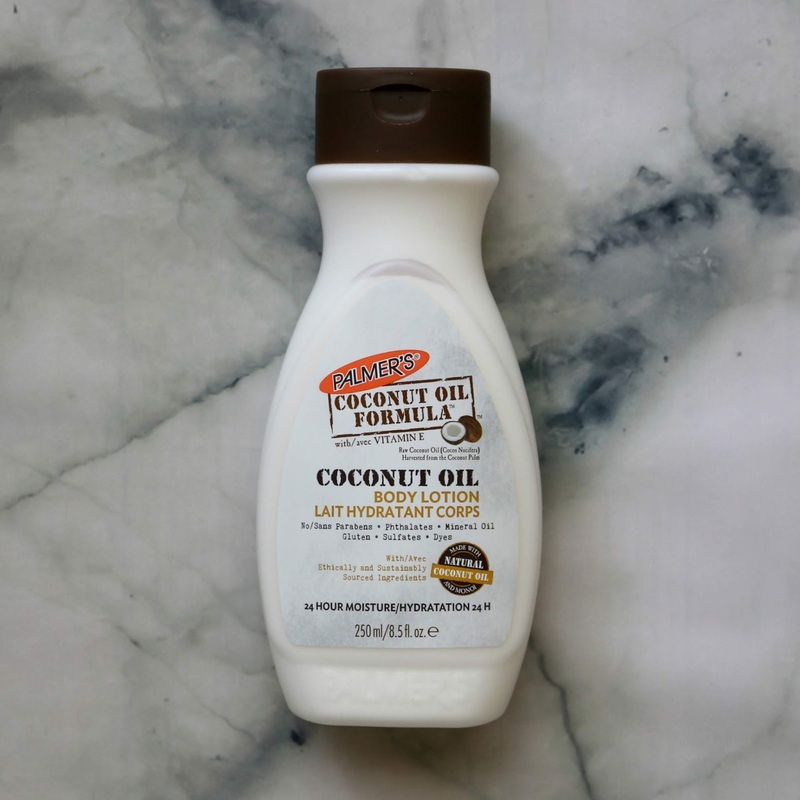 Oooh...I love coconut oil products and have never tried a coconut oil lotion. That is something I definitely want to try. I'm trusted Palmer's for years! Their cocoa butter lotion worked wonders on my stretch marks. I didn't even know they had a coconut oil spray. I'll check it out sometime. Coconut oil is really very great for the body as well as hair.The best thing is natural coconut extract oil has no side effects and does not harm the skin or oil. So the Palmers Cocounut oil body lotion sounds really promising. I love coconut oil, but i don't think there's Palmer's here in Philippines. Good news, there's palmer's product in Watson, i'm excited to try this coconut oil hydrating lotion. Nice, Love coconut oils and I've been using it for sometime and def. see the different. Good on ya! I was meaning to buy these products but thought would look for reviews first. Thanks for the honest review, will check it out next time for sure. I've used body lotion before of course but I've never used oil. I'll have to check this out. I have to try the body oil. i love and have used there cocoa butter stick forever. I love Palmer's products. They really work and I love the scent!